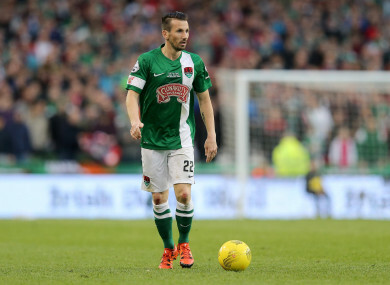 ORGANISERS OF A charity match to honour deceased Republic of Ireland international Liam Miller have been refused permission to host the game in Páirc Uí Chaoimh. The match, scheduled to take place on 25 September, will see an Ireland/Celtic XI managed by Martin O’Neill face off against a Manchester United XI to raise funds for Miller’s family. Players including Ryan Giggs, Paul Scholes, and Damien Duff will take part in the event for the late 36 year-old, who lost his battle with pancreatic cancer in February. But despite asking to use the recently-renovated home of Cork GAA, which has a capacity of 45,000, the game’s organisers were refused permission. The Cork County Board prohibited the use of the ground under the GAA’s controversial Rule 42, which bans the use of stadiums – excluding Croke Park – for other codes. Exemptions to the rule can only be granted at the association’s annual Congress, which does not take place until February. The match will now take place at Turner’s Cross, which has a capacity of just 7,000 people, and thousands of fans are expected to be left disappointed when tickets go on sale tomorrow. Cork lord mayor Mick Finn has acknowledged the rule, but has written GAA officials urging them to allow the match to go ahead in Páirc Uí Chaoimh. “The capacity issues are a concern for both the organisers and for Liam’s family,” he told TheJournal.ie. “They’d like to have it in Páirc Uí Chaoimh, especially because Liam also played GAA. But the Cork County Board say it can’t be done. Finn added that the Cork County Board were “receptive” to having the game played at their ground, but said they were obliged to obey GAA rules. There was a huge backlash to the decision on social media, with former Republic of Ireland international Andy Reid, who is playing in the match, hitting out at the GAA on Twitter. Meanwhile, over 3,000 people also responded to a listener poll by RTE Radio One’s Liveline, with 96% saying the game should be played at Páirc Uí Chaoimh. The Cork County Board has said it is bound by the GAA rule book. Email “GAA refuses permission for Liam Miller tribute match to be hosted at Páirc Uí Chaoimh”. Feedback on “GAA refuses permission for Liam Miller tribute match to be hosted at Páirc Uí Chaoimh”.